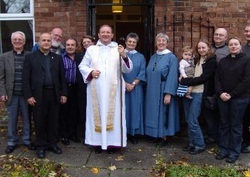 The Sisters of the Community of the Holy Name have a branch house in the parish, at St John's Rectory. St John's Rectory, St John's Road, Longsight, Manchester, M13 0WU. Reminder of God's new love each day. Our main morning prayer time. A short pause amid the day's work. Our main evening prayer time. Reflection on the day, thanking God for it. Our Sitting Room and Chapel are designed to be a Quiet Space in a Busy Place. Please feel free to contact us (see above for details) if you'd like to use that space.